This post originally appeared on Common Sense. You may read it in its original form here. Defense experts on both sides of the Atlantic have expressed concern about the increase in Russian submarine activity in the Atlantic Ocean. Russian patrols have risen by 50% to what one unnamed European diplomat described as “Cold War levels”. 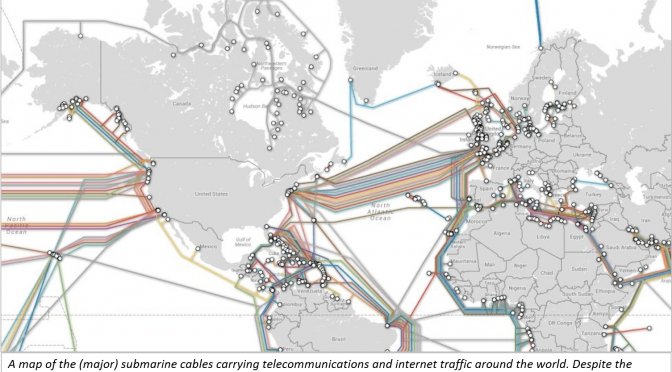 Not only the frequency of excursions has increased: the submarines are approaching the United States and Europe in areas with undersea cable routes. The cables are used for communications and internet data transmission; along with the fleet of satellites in low earth orbit, they are the spine of our digital world. 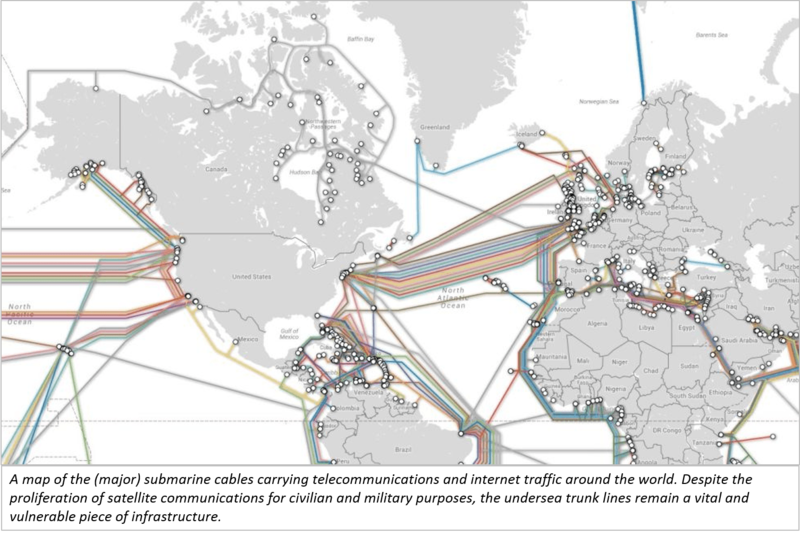 The United States and NATO allies still rely on these cables for vital military traffic. So far, the Russians have not been observed doing anything to the cables. But because of their importance, the presence of the submarines is alarming. The Russian Navy could be identifying the best places to cut the cables in the event of hostilities with the West; it could also be making efforts to tap them as a source of intelligence. Or they may have a different, unguessed purpose that is unrelated to the communications cables. What is certain is that the Russians are not simply passing the time of day; the Russian Navy is executing a mission and that mission somehow involves NATO. ntelligence gathering and signals interception remains the most probable activity. It has a long and distinguished history in warfare; the capture of a lost set of Confederate orders allowed General McClellan to bring General Lee’s Army of Northern Virginia to battle in unfavorable circumstances in Sharpsburg, Maryland, leading to an important Union victory in the Civil War. It has become critically important since the widespread adoption of wireless and radio communications during the First and Second World War. Everyone knows that the British built the world’s first computer at Bletchley Park in order to crack the German ENIGMA codes, though the incredible Polish contributions to that effort remain overlooked. The United States had successfully broken Imperial Japanese diplomatic codes prior to Pearl Harbor, and were used to prepare the US Navy for the critical Battle of Midway. The US Navy also pioneered the use of submarines and deep-sea submersibles for intelligence gathering, tapping the unencrypted military communications between the mainland and facilities along the Kurile Islands. We continue to deploy these assets, such as the USS Impeccable. Assisting the submarines is the Russian Navy’s Oceanographic Research VesselYantar. The Yantar is newly commissioned, having come off the Kaliningrad slips early this year, and has nothing in common with Jacques Cousteau and the Calypso despite its scientific-sounding designation. It is an intelligence platform, operated by the Russian Navy for the Glavnoje Razvedyvatel’noje Upravlenije, or Main Intelligence Directorate. Although less infamous than its sister organization, the KGB (now FSB), the GRU is the larger of the two organizations with six times more foreign agents deployed that the Foreign Directorate of the FSB. The Yantar was tracked by the Department of Defense as it approached and followed the North American coast from Canada down to the Caribbean. The Yantar carries deep-sea submersibles of the same kind the US Navy uses for a similar purpose: finding, tapping and potentially cutting undersea communications cables. After its leisurely voyage, including passing the US nuclear submarine base in Kings Bay, Georgia, the Yantar made its way across the Atlantic back towards Europe. On the 19th of October, the spy ship arrived at its destination: the Spanish port of Ceuta. There it received a warm welcome, with a protected berth and round-the-clock security provided by the port authorities. It took on fuel and consumables while its sailors stuffed their gobs with paella and vino tinto while also engaging in the other profligate activities typical of sailors ashore. As comradely a reception as Ivan could have received in Kaliningrad. But Ceuta is not Kaliningrad. It is a port belonging to a NATO ally. It is strategically located on the North African coast next to the Straits of Gibraltar, one of the busiest maritime transit points in the world. And it is an easy day’s steaming from RN Gibraltar, a port that Royal Navy vessels often visit, as well as the naval station of Rota, a base leased by the US Navy from Spain. That is where the US is basing four Aegis-equipped destroyers as part of the European Phased Adaptive Approach to ballistic missile defense. What in God’s name is a Russian intelligence vessel doing there? The Yantar visit is not an isolated incident: this year alone there have been 14 port calls by Russian naval vessels to Ceuta and 58 in total since 2010. 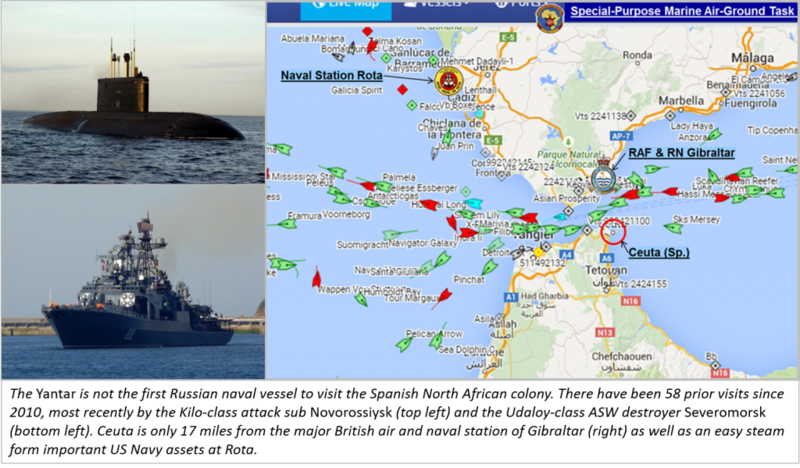 In August, the diesel attack submarine, RFS Novorossiysk passed three days in the Spanish colony, with Gibraltar well within range of its SS-N-27 “Sizzler” anti-ship missiles. In April, it was the Udaloy-class ASW destroyerSeveromorsk; and in February another ASW frigate, the Yaroslav Mudry. The city fathers are happy to have 2,000 lonely sailors spending their rubles on “shore leave” and local businesses benefit too. Nothing to comment on in normal times; except that we’re not living in normal times. Russian troops are still in Ukraine; NATO aircraft are intercepting Russian bombers over allied airspace; Turkey is reporting violations of its airspace by Russian drones and jets; and we are not sending troops and equipment to Eastern Europe because relations are warm and fuzzy. It is long past time the United States took a firmer line with Spain. Spain may be an important ally for us and NATO, with a strategic location and shared interest in the stability of North Africa and the Sahel. It is not a question of gratuitously humiliating or infuriating them. But the US must make it crystal clear to Spain that they must choose their side and stick with their friends. They cannot play both sides: they cannot take American dollars for the use of Rota and Russian rubles for the use of Ceuta. Our concern and extreme displeasure at having half the Russian fleet pass the time of day within a hundred miles of our ballistic missile defense assets must be communicated to the Spanish in no uncertain terms. And the consequences of this perfidious attitude should also be made known – discretely. Intelligence sharing between the two nations might begin to suffer. The notable successes of Spanish police in intercepting and arresting ETA operatives and potential jihadists in recent years is not due entirely to the keen sense of the beat cops, but to good intelligence and timely cooperation between the Spanish, French and American agencies. If Spain still refuses, the US should consider a relocation of US assets to the Port of Lisbon (USN) and to Beja for the Marine Crisis Response Force – Africa. Both are almost as well situated as the current locations and the Portuguese are not hosting Russian warships. Unless the US and NATO take firm measure, Spanish will remain indifferent and their “business-as-usual” attitude will continue. It is not only avaricious and in bad faith, it is dangerous to Spain’s own interests. They may come to find, like the Crimeans, Moldovans and others, that once Ivan gets comfortable, he is not an easy houseguest to get rid of. And neither Ceuta nor Melilla are covered by NATO’s Article 5 provision for mutual defense. The SVR, Sluzhba vneshney razvedki. As far as Gibraltar is concerned the responsibility for the maritime security of Gibraltar Territorial Waters falls under very awkward operational procedures and tasking. The MOD through the Royal Navy Gibraltar Squadron is tasked with, according to its mission statement “To contribute to the maritime defence and security of Gibraltar and when necessary, the prosecution of offensive maritime operations in order to allow BFG to support military ops as directed by HMG.” Quite a mouthful and perhaps ambiguous but it’s not the intention to assess the political ramifications of such a broad statement. Bearing all this in mind, the security of HM Naval Base Gibraltar falls into question. Every time a naval vessel is berthed alongside South Mole or “The Tower” a boom is placed across the harbour from South Mole to the old Gun wharf site. It consists of small orange buoys held in position by floaters and strung across with rope. This is to prevent unauthorised craft from entering the security cordon. The security boom is totally inadequate and useless. Any determine driver of a jet ski or RHIB can “jump” this boom and instantly find itself within a restricted area. The MOD should invest in purpose built security booms that protect warships, particularly submarines in naval bases around the world. It has not gone unnoticed that since 2013 there has been an increase of RN nuclear power submarines visiting the naval base. Various operational tasks have been carried out including transfer of weaponry that demand the highest levels of security. This cannot be guaranteed with a weak protective boom that can be easily penetrated. 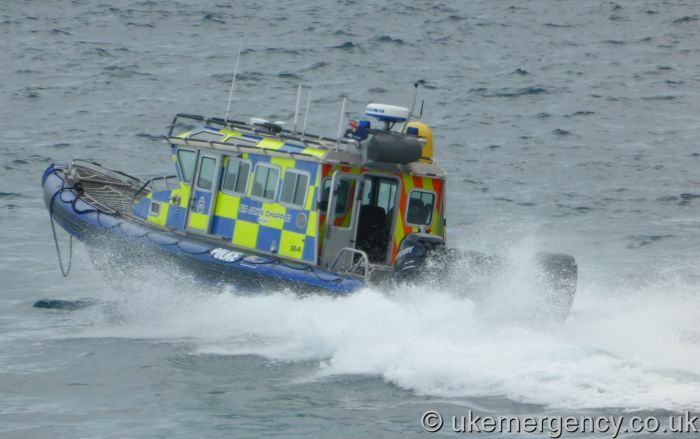 On the fifth of July a drug smuggling jet ski entered the harbour through the southern entrance whilst HMS Ambush was alongside South Mole. Luckily, the intruder turned left and not right. The inadequacy of this security boom is a glaring capability gap that can be exploited by the enemy. Within this boom the task of protecting these warships is carried out efficiently by the GDP (Gibraltar Defence Police). Despite being equipped with 2 slow and aging ex Range Safety craft that are not fit for purpose they stick to their duty of affording port force protection but their response time to a fast intruder is minimal. GDP were to be equipped with modern patrol craft some time ago but it was decided otherwise to renege on it, another UK base benefitting from these new craft. 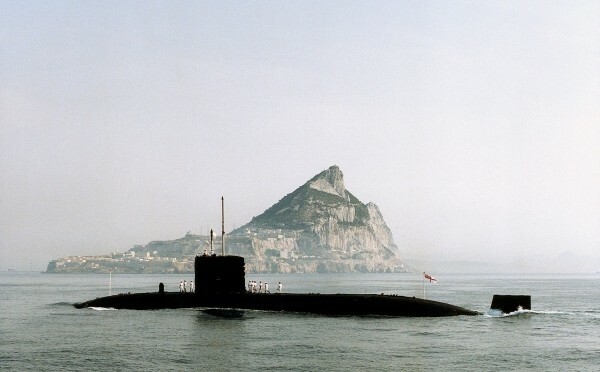 For years there has been a succession of UK politicians and high ranking military officers trumpeting and touting the importance of Gibraltar as a base for UK ops. It’s time they put their money where their mouths are and transmit their thoughts into deeds. Leaving aside the MOD estates we come to the protection of the civilian population which is by and large entrusted to the marine section of the Royal Gibraltar Police. This service boasts the most modern and fast craft to carry out their duties. There is a certain overlapping of responsibilities with the RN that due to constitutional obligations muddies the waters as to who is responsible for what when and how. This is rather unhelpful when it comes to tackling a potential terrorist threat. We are led to believe that there is coordination when it comes to security matters at sea but to a plain simple observer it does not appear to be so. A more robust communication environment should be encouraged to interchange ideas thoughts and indeed intelligence on a regular basis, not on ad hoc terms. To use a well worn phase everyone should be “singing from the same hymn sheet” instead of tearing out pages so that the other sings out of tune. Gibraltar’s important maritime security infrastructure requires overhauling and redesigning. Our hugely important cruise liner industry can sometimes walk a tight rope when it comes to passenger and owner satisfaction. Cruise liners are vulnerable and a tempting target. On very few occasions are cruise ships escorted to and from the liner terminal by law enforcement craft and there is no seaward protection whilst alongside North Mole. This would prevent any unwanted or inquisitive boats from getting too close for comfort. We must bear in mind that although Cruise liners companies might be satisfied with ashore security arrangements any incident no matter how small or insignificant at sea could cause them to leave and this would destroy an important pillar of our economy. Why not go the extra mile and provide seaside security to such an important gem in our crown? It will enhance our reputation amongst cruise line companies as a serious port of call in which to do business with. These are but a few of the more noticeable flaws in the protection of our little country. I accept the fact that security cannot be 100% guaranteed but it can be made extremely difficult for anyone attempting to threaten our peace and stability. It serves no purpose to find faults and criticize without offering suggestions and ideas in which to improve the protection of our waters from dynamic situations that confront our day to day lives. With the expansion of yachting facilities at Ocean Village and the proposed reclamation at the Eastside there will be an increase in the load factor for law enforcement agencies in maintaining a safe maritime picture. A maritime surveillance system similar to the Spanish SIVE (Systema Integrado de Vigilancia Exterior) should be considered as an aid to combating illegal activities close to our shores This system comprises of radars, infrared cameras and other surveillance equipment placed at strategic sites and controlled by an operations room. Any information gathered by this system can be transmitted to civilian law enforcement vessels (RGP HM Customs Port Authority) in real time via video link. It will make the task of intercepting suspect vessels easier and with ample time. The introduction of a joint maritime control centre is of vital importance. It is of huge value that all incidents be controlled “under one roof” thereby improving response times and rapid interventions. Everyone working together instead of pulling away from each should be encouraged. Pooling of resource can be an effective method of dealing with certain events/actions whilst each law enforcement agency maintaining their independence and freedom of movement in their particular field of responsibilities. Joint training exercises whether live or in tabletop format can be useful in honing particular skills and at the same time exchanging operational experiences. Of course the major stumbling block is finance as all these suggestions do not come cheaply, but in the long term it is an investment that will pay dividends by ensuring the adequate protection of life and property. Like many of its regional peers, the Philippines is in the midst of a defense buildup, motivated in no small part by China’s assertive moves in the western Philippine Sea and the resource-rich Spratly islands. The donation this week of two Balikpapan-class Landing Craft Heavy (LCH) from Australia was the most recent boost to Philippines defense efforts. The LCH donation is particularly timely, as it complements the upcoming pair of Strategic Sealift Vessels (SSV), being built by PT PAL Indonesia. Based on the Indonesian navy’s successful Makassar-class Landing Platform Dock (LPD), the 8,600-ton amphibious lift ships can transit to remote areas and serve as a mobile base for helicopters and smaller landing craft. As evidenced during Typhoon Haiyan, the dearth of such assets hampered the Philippine government’s aid response to the hardest-hit parts of the country. As gifts stand, the donation of ex-HMAS Tarakan and Brunei is particularly generous – the Royal Australian Navy will hand them over fully refurbished with new safety and navigation components, plus spare parts packages. Manila is considering purchasing the three remaining LCHs as well. While the media focus of Manila’s defense acquisitions under the Capability Upgrade Program has been centered on big-ticket items to restore basic conventional force capabilities, there have been other, quieter acquisitions that directly support war-fighting and maritime domain awareness (MDA). Notably, the service signed a Memorandum of Understanding in 2014 with the Philippine National Oil Company to transfer three retired 2,500 ton petroleum tank ships. This acquisition would enable fuel replenishment at sea and increase on-station time for high-endurance assets like the patrol frigates Ramon Alcaraz and Gregorio Del Pilar, both formerly U.S. Coast Guard Hamilton-class cutters. Another low-profile capability is the National Coast Watch Center program—a surveillance system designed to monitor oceanic traffic in the western Philippine Sea. As expected, details of this national intelligence capability are closely held, but much of it is likely based on the successful implementation of the earlier Coast Watch South program. With heavy U.S. assistance, the Philippines created a network of monitoring stations combining radar, maritime surveillance and radio/data networks that provides a real-time strategic and tactical “picture” of oceanic traffic in the Southern Philippines—the so-called Sulawesi Sea Triangle. That area is a hotbed of illicit trafficking by sea and a favored logistical trail for transnational insurgent forces that prowl the region. When completed in 2015, the west-facing Coast Watch chain will monitor the Philippines’ Exclusive Economic Zone (EEZ), extending 200 nm into the contested Spratly Islands group. In the future, additional monitoring chains will cover the Northern and Eastern facing portions of the country as well. The most recent, visible and well-publicized modernization program has been the integration of the multipurpose helicopter program with the patrol frigate force. Five Augusta-Westland A109s twin-engine helicopters equipped with forward-looking infrared have been delivered to the fleet to replace long-retired BO-105s. From an operational perspective, the navy has made quick strides to integrating the air asset with ships of the line. The AW109s had a maiden deployment on board Ramon Alcaraz during the Australian multinational military exercise Kakadu 2014, approximately eight months after receiving the first helicopters. Out of all the projects to restore capabilities, the navy is still awaiting final determination of its premier acquisition – the multi-role frigate. The Philippines wants to buy two units to serve as major and modern combatants of the patrol frigate force. 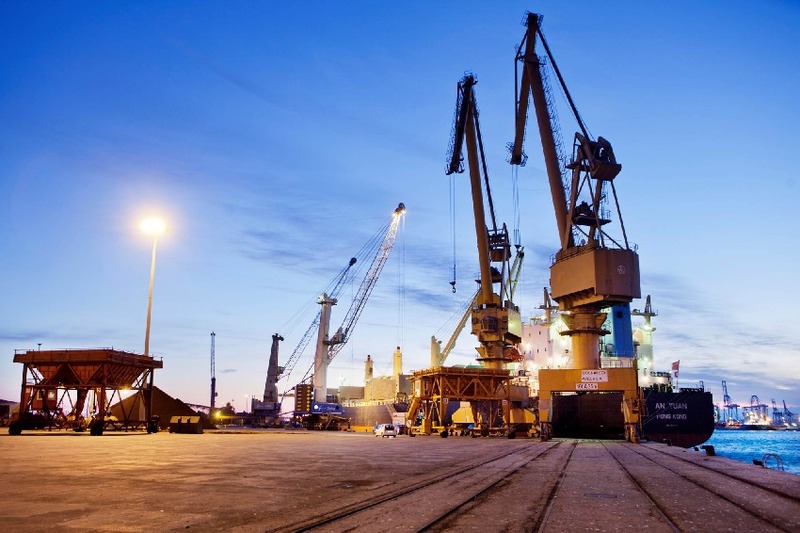 While the negotiations have been stymied by a complex two-phase process, a list of qualified bidders has emerged, including well-known Spanish shipbuilder Navantia and several South Korean firms, among others. A winning bid was to be selected in late 2014, but the acquisition process reportedly has been complicated by efforts to separate the tracks of selecting a ship from the embedded weapon systems. This may have to do with current challenges of the Philippines not being easily cleared for purchases of regional-balance changing weapons, such as a long-range surface-to-surface missile, with which this ship class is normally equipped. The Armed Forces of the Philippines has benefited under President Benigno Aquino III’s administration. To date, multiple modernization programs have either reached significant acquisition stages or have been completed entirely during his tenure. However, as the new paint smell wears off for the navy, the historical challenges that have haunted its past acquisitions and programs loom. It is critical that the next presidential administration continue to support the acquisitions, as well as the services, both politically and fiscally. The navy needs to ensure that internal expertise among the ranks to maintain their newly acquired equipment is present and sustainable. Above all, operating effectively and efficiently at sea continues to be the primary objective. The nation’s seafaring history and ties to the maritime culture give impetus to the current goals of ensuring territorial integrity and establishing a credible defense. Given the relatively rapid pace of modernization, the Philippine navy is well on the road to restoring the capabilities necessary to meet those demands. This article can be found here in its original form on the USNI website and was republished by permission.